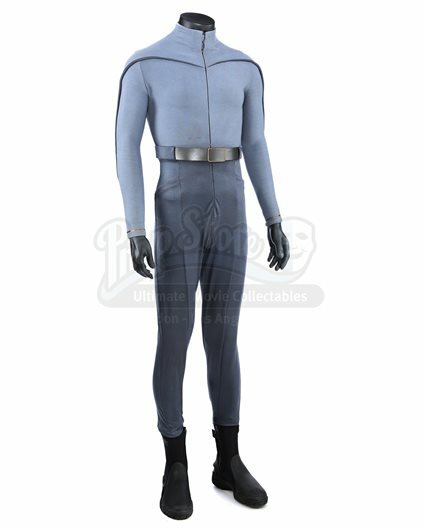 Star Trek Live Auction (#95) 12/02/2017 11:00 AM PST CLOSED! 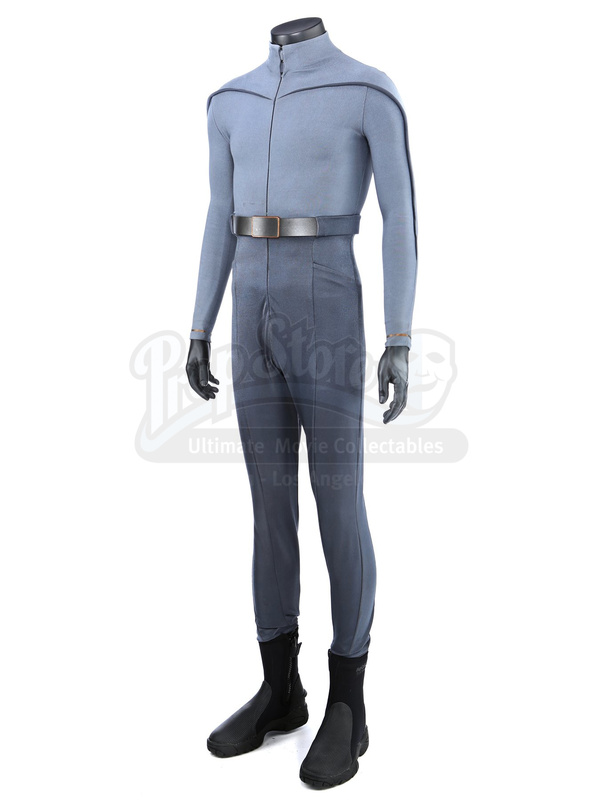 A men's Kelvin sciences uniform from Star Trek. Crewmen wore their uniforms on the USS Kelvin when they were attacked by the Narada, a Romulan ship that brought about an alternate reality. 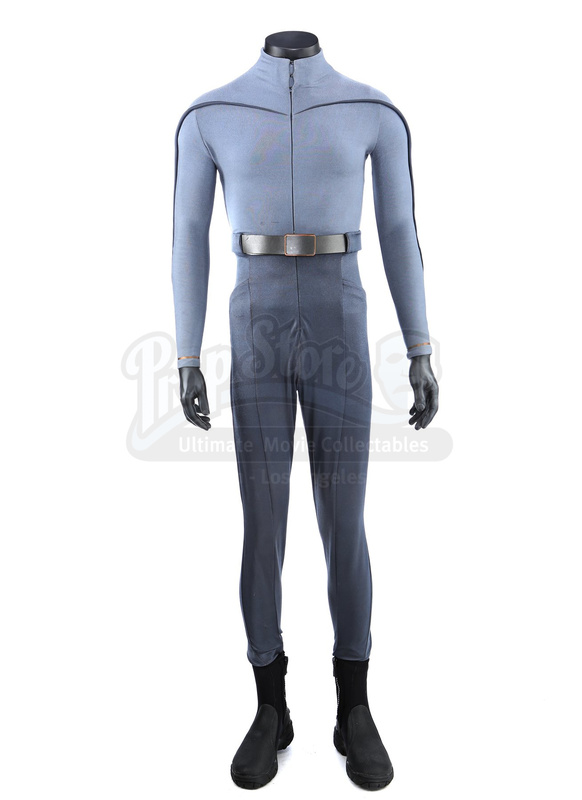 The uniform includes a custom-made Spandex Starfleet jumpsuit (small) and a pair of neoprene diving boots (medium). The grey Spandex jumpsuit has a zip front and features piping from the chest to the wrists and a built-in leather belt. The high-top diving boots are made of neoprene with sturdy rubber soles and feature side zippers. Also included is a wardrobe tag with hand-written notes about the costume. *Estimated sale price; sold without reserve. 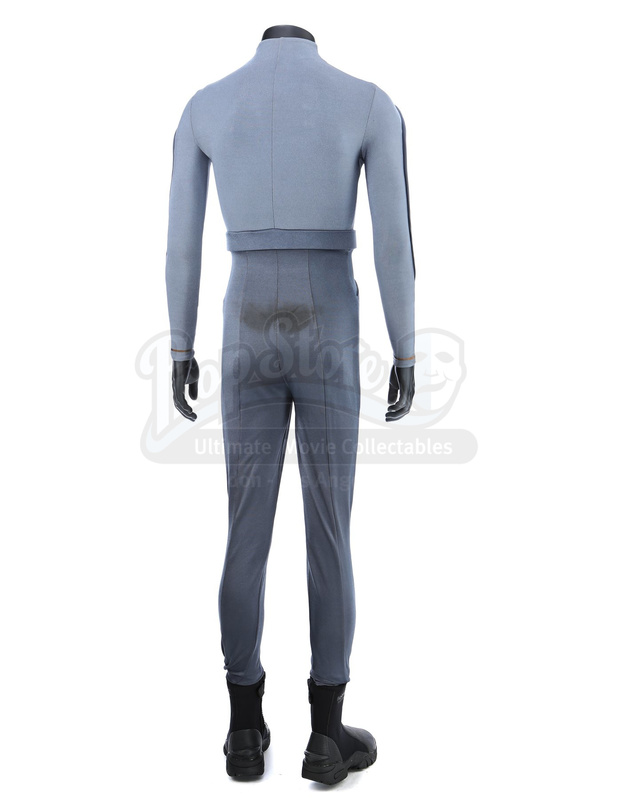 This is an original asset used in the production of STAR TREK (2009). 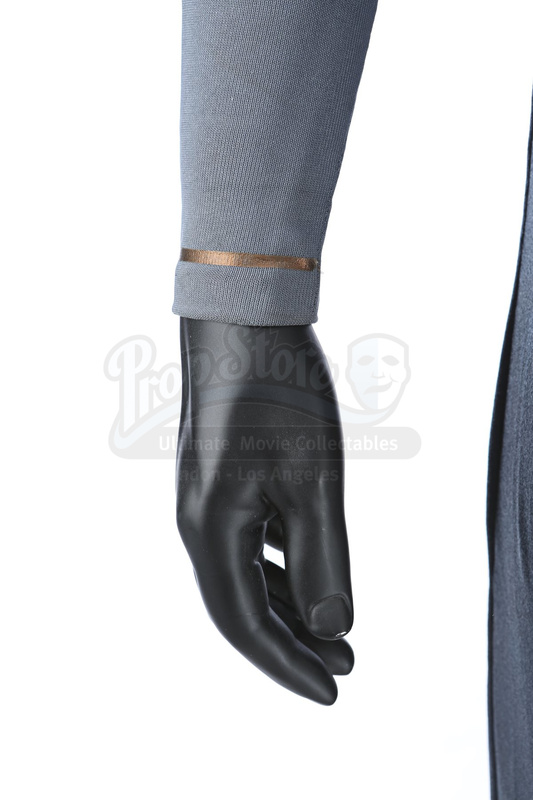 The asset is made available through Prop Store in association with Paramount Pictures. This is not a replica, but rather an original item from the making of the film(s). The auction is being held live at Prop Store Los Angeles in Valencia, CA on December 2 at 11am PDT. Bidders can participate in person, via telephone, or here in the online bidding platform. The online bidding platform accepts pre-sale bids until the auction begins. Once the auction begins, the online bidding platform can be used to place bids in real-time during the live auction, as the auctioneer sells each lot. Bidders should be aware there is a 2-3 second delay in the live stream of the auctioneer, and therefore bidders using the online platform are encouraged to place their bids quickly before the lot is sold. Those wishing to bid in-person are advised to arrive early to register for the auction. This is a no-reserve auction. Pre-sale estimates are intended as a guide for prospective bidders only. The final sale price of each lot will be determined by the bidding activity. A preview exhibition showcasing many of the key auction lots will be open to the public at Prop Store’s Valencia facility from Monday, November 27 – Friday, December 1. The exhibition offers an opportunity to examine the lots in person, register for the auction and speak with Prop Store staff about the material. Lots not present in the exhibition can be viewed by appointment and lots can be viewed prior to the exhibition by appointment, as well. Please email us. Payment can be made by Visa, Mastercard, American Express, Discover, cash (to a limit) and bank transfer. Invoices will be sent once bidding on all auction lots have closed. Payment (in full, or initial deposit payment) must be received within 7 days of the initial purchase. Payment plans of up to a maximum of 6 months are available for any lots with a final hammer price of over $100. Customers within California will be subject to 9.5% Sales Tax on the final winning bid and Buyer’s Premium. Payment plans over a maximum of 6 months are available for all lots with a final hammer price of over $100. Lots are located in California, USA, and can be shipped worldwide. The Buyer is solely responsible for all shipping, handling, and delivery costs. Prop Store can help you arrange packing and shipping through FedEx for smaller items or PackAir Airfreight, Inc. for larger items, or you can use your own licensed carrier, approved by Prop Store. For many Lots, automatic shipping quotes are available through the button at the top of the listing. For oversized Lots, click here to request a freight quote from Prop Store staff. Prop Store staff can also assist with quotes for shipping multiple lots together; contact us for further information. Customers are strongly advised to request a shipping quote prior to bidding. These Terms and Conditions of Sale (“Conditions”) set out the agreement between the Bidder/Buyer and Prop Store and the Seller. By registering to bid and participate in a Prop Store Auction, you will be deemed to have read and agreed to be bound by these Conditions and the accompanying Buyer’s Guide, as set forth in the catalog for the Auction and online at www.propstore.com. 2.1. All Lots are sold subject to their condition at the date of the Auction. The nature and age of the Lots mean they are often unique and are likely to have wear and tear, damage and other imperfections. By making a bid, the Bidder accepts the actual condition of the Lot and acknowledges that if a bid is successful, the Buyer will buy the Lot “as is”. 2.2. Prop Store’s staff are not professional restorers so descriptions of Lots, images and statements of condition in Prop Store’s catalog or on its website are for illustrative purposes only. Prop Store cannot guarantee that colors are properly shown. Save for Prop Store’s Terms of Guarantee of Attribution, all Lots are sold “as is”. Bidders are encouraged to inspect Lots and satisfy themselves as to their condition before bidding, seeking and obtaining independent professional advice where required. 3.1.3. As part of the registration process, Prop Store will run an authorization on the credit card provided by you in the amount of $0.01 to confirm the validity of the credit card information provided. The authorization will be for one day only and the amount of the authorization will be released thereafter. The authorized amount will not actually be charged. Please acknowledge your consent to such an authorization by clicking the box below. If you do not agree to such an authorization, please be advised that your registration will not be approved and you will not be able to participate in the Auction. 3.1.5. Any person seeking to participate in the Auction as an agent on behalf of a registered principal must complete and submit an Agent Information Form, and provide an up-to-date, valid government-issued photo identification (e.g., passport, driver’s license), as well as a written authorization from the principal confirming the agent’s authority to participate at the Auction on the principal’s behalf. 3.1.6.4. Inform the Bidder about other auctions, products and services provided by Prop Store and its affiliates (please contact Prop Store by email at enquiries@propstore.com or by phone +1 818 727 7829 if you do not wish for your information to be used for such a purpose). 3.1.7. By participating in and/or attending the Auction and signing the registration form, each Bidder consents to be filmed and/or photographed and agrees and authorizes Prop Store to use and publish such film and/or photographs and likeness for use in (1) providing online access to the Auction, (2) recording the results of the Auction, (3) print, digital, online and all other media for marketing purposes (including without limitation, on Prop Store’s website, YouTube and other online platforms) and (4) in any other Prop Store publications of whatever nature. The Bidder releases Prop Store and holds it harmless from any reasonable expectation of confidentiality or privacy associated with such images and releases Prop Store and any third parties involved in the making, creation or publication of the images or any marketing or other materials derived therefrom from all and any liability for claims made in respect of such publication. Publication of the images in whatever format confers no right of ownership on the individual or right to royalties or payment. 3.2.1. During the Pre-Auction Viewing period, as set forth in the Auction catalog, any Bidder may preview Lots free of charge by appointment with Prop Store. 3.3.1. At Bidder’s request, without any liability therefor, Prop Store can provide shipping estimates before the Auction. Any Bidder requesting this information should email support@propstore.com including the Lot number and shipping address at least 3 days before the start of the Auction. Real-time shipping estimates are also available on many lots through the online bidding platform. 3.4.1. If the Bidder is located outside the United States, it is the Bidder’s sole responsibility and obligation to ensure in advance of the Auction that any Lot purchased in the Auction can be exported from the United States and imported into the country of destination. No sale will be canceled because the Lot may not be imported into the country of destination. PackAir Airfreight, Inc., a third-party independent freight vendor, can advise Bidders on relevant export licensing regulations and may submit export license applications upon request. Neither Prop Store nor PackAir Freight, Inc. can guarantee that any licenses, permits or consents will be granted, and shall have no liability arising out of or relating thereto. 4.1.1 This is a No Reserve auction. There is no minimum selling price on any Lot of property offered for sale in the Auction. Pre-sale estimates are intended as guides for prospective Bidders and Prop Store makes no representation or warranty of the anticipated selling price of any Property. No estimate anywhere in any media by Prop Store of the selling price may be relied upon as a prediction of the actual selling price. Notwithstanding the same, until the start of the Auction by the auctioneer, Prop Store may, in its sole discretion, withdraw any Lot from sale at Auction. 4.2.2. Bids may not be accepted from unregistered bidders and all Bidders must be 18 or over. All bids must be made in US dollars. 4.2.3. When making a bid, every Bidder acknowledges that such bid is a binding offer to buy the Lot at that price (plus the Buyer’s Premium, Credit Card Fee (if applicable), all applicable taxes, and any and all shipping charges, storage fees and/or other costs). 4.2.5. The auctioneer may accept bids from Bidders present in the sale room, via telephone, or via online at the time of the Auction. The auctioneer may also accept proxy or absentee bids delivered to Prop Store before the start of the Auction. Proxy or absentee bids must be submitted either by using the form in the Buyer’s Guide or the online form at www.propstore.com. Proxy or absentee bids will be executed at the lowest possible price. If Prop Store receives proxy or absentee bids on a particular Lot for identical maximum bids, and at the Auction these are the highest bids on the Lot, it will be sold to the Bidder whose written bid was first received by Prop Store. 4.2.6. Any Bidder wishing to place bids at the time of the Auction via telephone must provide to Prop Store a list of Lots on which they intend to bid at least 24 hours before the start of the Auction. 4.2.8. Except as expressly stated in the Buyer’s Guide or the Conditions, Prop Store shall have no liability arising out of or related to any errors or omission in respect of bids made online, by telephone or by proxy. 4.3.1. The auctioneer has the right to exercise reasonable discretion in refusing any bid, advancing the bidding in such a manner as he or she may decide, dividing any Lot, combining any two or more Lots and, in the case of error or dispute, and whether during or after the sale, determining the successful Buyer, continuing the bidding, cancelling the sale or reoffering and reselling the Lot in dispute. If any dispute arises after the sale, then, in the absence of any evidence to the contrary the sale record maintained by the auctioneer will be conclusive. 4.3.3. Subject to the auctioneer’s reasonable discretion, the Bidder placing the highest bid accepted by the auctioneer will be the Buyer and the striking of his hammer marks the acceptance of the highest bid and the conclusion of a contract for sale between the Seller and the Buyer. Each Bidder understands and agrees that Prop Store, as auctioneer, is not a party to any contract for sale that results from the Auction. Risk and responsibility for the Lot (including frames or glass where relevant) passes to the Buyer upon the fall of the hammer and the Buyer should arrange insurance cover for the Lot if required. 5.1.1. Prop Store will notify the Buyer and send (by email unless requested otherwise) a payment invoice setting out the Purchase Price and itemizing the Hammer Price, the Buyer’s Premium, Credit Card Fee (if applicable), plus any applicable sales tax, within 7 business days of the end of the Auction. For all sales within California, sales tax at the prevailing rate (currently 9.5%) will be applied to the Purchase Price. Delivery addresses outside California will be exempt from sales tax. 5.1.3.1. If the 1-month payment plan is selected, the balance of the Purchase Price shall be due within 30 days of the close of the Auction. 5.1.3.2. If the 2-month payment plan is selected: 40% of the Purchase Price shall be due within 30 days of the close of the Auction; 40% of the balance of the Purchase Price shall be due within 60 days of the close of the Auction. 5.1.3.3. If the 3-month payment plan is selected: 26.66% of the Purchase Price shall be due within 30 days of the close of the Auction; 26.66% of the balance of the Purchase Price shall be due within 60 days of the close of the Auction; and 26.68% due within 90 days of the close of the Auction. 5.1.3.4. If the 4-month payment plan is selected: 20% of the Purchase Price shall be due within 30 days of the close of the Auction; 20% of the Purchase Price shall be due within 60 days of the close of the Auction; 20% of the Purchase Price shall be due within 90 days of the close of the Auction; and 20% due within 120 days of the close of the Auction. 5.1.3.5. If the 5-month payment plan is selected: 16% of the Purchase Price shall be due within 30 days of the close of the Auction; 16% of the Purchase Price shall be due within 60 days of the close of the Auction; 16% of the Purchase Price shall be due within 90 days of the close of the Auction; 16% of the Purchase Price shall be due within 120 days of the close of the Auction; and 16% due within 150 days of the close of the Auction. 5.1.3.6. If the 6-month payment plan is selected: 13.33% of the Purchase Price shall be due within 30 days of the close of the Auction; 13.33% of the Purchase Price shall be due within 60 days of the close of the Auction; 13.33% of the Purchase Price shall be due within 90 days of the close of the Auction; 13.33% of the Purchase Price shall be due within 120 days of the close of the Auction; 13.33% of the Purchase Price shall be due within 150 days of the close of the Auction; and 13.35% due within 180 days of the close of the Auction. 5.1.4. Prop Store offers no grace period on payment plan deadlines. If the Buyer does not adhere to payment deadline as set forth above, the Buyer shall be deemed to be in default. In the event of default all funds already paid to Prop Store shall be retained by Prop Store as liquidated damages. Moreover, Prop Store and/or the Seller shall also be entitled to any other remedies available, whether in law or equity. 5.1.7. Only the memorabilia item shown in the photos of a given product listing is included in the sale. Mannequins, display stands, and scale measures are not included with your purchase, unless expressly stated in the product description. 5.1.10. Payment must be in US dollars and may be made by electronic transfer, debit card, credit card (up to a maximum of $25,000), bankers draft or check (drawn on a US bank account – note check clearance can take between 5 and 10 working days), or cash (up to a maximum of $5,000). Please note that the Credit Card Fee will be charged and payable in addition to the Purchase Price on any amounts paid by credit card. Please quote the Lot number, invoice number and Bidder registration number when making payment to ensure it can be processed as efficiently as possible. 5.1.11. If payment is made by credit card, the Buyer expressly agrees that such payment is nonrefundable nor may be credited to any other purchase, and that the Buyer will not undertake any action or effort to stop payment, seek a refund, or attempt a charge back of such amounts – or any Credit Card Fee assessed thereon – by the issuer of the credit card. 5.2.1. Failure to timely make payment of any amounts due to Prop Store and/or the Seller shall constitute an event of Default by the Buyer. In the event of Default for nonpayment, Prop Store may charge interest on the unpaid amount at the rate of 5% a year above the base lending rate of Bank of America from time to time. The base lending rate shall be the average lending rate of Bank of America for the 6 months preceding the date of default. If such interest rate exceeds the legal rate permitted by law, then the maximum legal rate permitted by law shall apply. This interest shall accrue on a daily basis from the due date until the date of actual payment of the overdue amount. The Buyer must pay Prop Store interest together with any overdue amount. 5.2.2. If any applicable conditions herein are not complied with (to a material extent), the Buyer will be in Default and in addition to any and all other remedies available to Prop Store by law, including, without limitation, the right to hold the Buyer liable for the total Purchase Price, including all fees, charges and expenses more fully set forth herein, and as set forth in paragraph 4.2(a) herein, Prop Store, at its option and to the extent permitted by law, may (i) cancel the sale of that, or any other items sold to the defaulting Buyer, retaining as liquidated damages all payments made by the Buyer, (ii) resell the purchased item, or (iii) effect any combination thereof. In any case, the Buyer shall be liable for any deficiency, any and all costs, handling charges, late charges, expenses of both sales, legal fees and expenses, collection fees and incidental damages. 5.2.3. Prop Store may, in its sole discretion, apply any proceeds of sale then due or thereafter becoming due to the Buyer from Prop Store or any affiliated company, or any payment made by the Buyer to Prop Store or any affiliated company, where or not intended to reduce the Buyer’s obligations with respect to the unpaid item or items, to the deficiency and any other amounts due to Prop Store or any affiliated companies. In addition, a defaulting Buyer will be deemed to have granted and assigned to Prop Store and its affiliated companies, a continuing security interest of first priority in any property or money owing to such Buyer in our possession or in the possession of any of its affiliated companies, and Prop Store may retain and apply such property or money as collateral security for the obligations due to Prop Store or to any affiliated company. Payment will not be deemed to have been made in full until Prop Store has collected good funds. 5.2.7. Prop Store shall be entitled to retain Lots sold until all amounts due have been received in full in good cleared funds or until the Buyer has performed any other outstanding obligations as Prop Store shall reasonably require. 5.3.1. The Buyer is solely responsible for all shipping, handling, and delivery costs. Prop Store can help you arrange packing and shipping through FedEx for smaller items or PackAir AirFreight, Inc. for larger items, or you can use your own licensed carrier, approved by Prop Store. 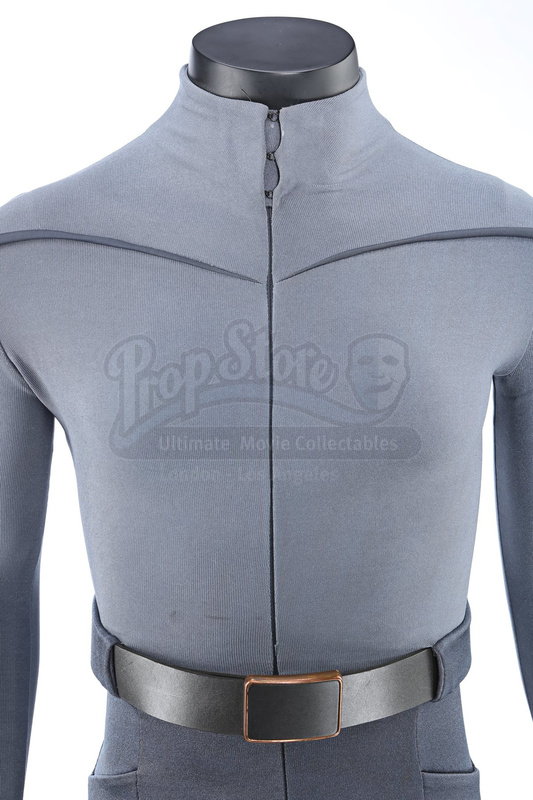 Please contact Prop Store at +1 818-727-7829 or supportLA@propstore.com for further details. Prop Store does not warranty the Lots against and shall have no liability for any damage that any Lot may incur or suffer during the shipping or delivery process. 5.3.2. After 14 days after close of Auction, if the Buyer has not made arrangements for and paid the shipping cost of the Lots purchased, or has otherwise failed to collect the Lots, a storage fee of 3% of the Hammer Price per month shall be charged to the Buyer. If the Buyer has failed to pay the Purchase Price and the cost of shipping and handling, Prop Store, at its option may cancel the sale. 5.3.5. Unless otherwise agreed by Prop Store in writing, the fact that the Buyer wishes to apply for an export license does not affect or postpone the Buyer’s obligation to make payment in accordance with Prop Store’s payment terms nor Prop Store’s right to charge interest or storage charges on late payment. Prop Store shall not be obligated to rescind or cancel a sale nor to refund any monies paid by the Buyer to Prop Store as a result of or related to the Buyer’s failure or inability to obtain an export license. 5.3.6. Should the Buyer make own arrangements with third parties for shipping, handling, or delivery of any Lots, Prop Store shall have and accepts no liability or responsibility for the acts or omissions of any such third parties. Similarly, where Prop Store suggests other handlers, packers or carriers, its suggestions are made on the basis of its general experience of such parties in the past. Although Prop Store shall use reasonable efforts to take care when selecting third parties for shipping and delivery, and the Buyer understands and agrees that Prop Store is not responsible to any person to whom it has made a recommendation for the acts or omissions of the third party concerned. 6.1. Prop Store warrants the attribution of each Lot as stated in the title block (film title and item title) of that Lot in the Auction catalogue, subject to any revisions (which may be given in writing or online before or during the Auction at which the Lot is purchased by the Buyer); this is Prop Store's Guarantee of Attribution. Buyers should be aware that multiple examples of props and costumes are frequently used during production and it is often impossible to determine whether a specific piece has been used on-camera. Any specific on-camera usage known to Prop Store will be noted within the description, but no warranties are given by Prop Store on that description. 6.2. If a Buyer demonstrates, to Prop Store’s reasonable satisfaction, that the Guarantee of Attribution is materially incorrect, the sale will be rescinded if the Lot is returned to Prop Store in the same condition in which it was at the time of sale. In order to satisfy Prop Store that the Guarantee of Attribution is materially incorrect, Prop Store reserves the right to require the Buyer to obtain, at the Buyer’s expense, the opinion of two experts in the field, mutually acceptable to Prop Store and the Buyer. Purchase Price shall be the Buyer’s sole remedy for an incorrect Guarantee of Attribution, to the exclusion of all other remedies to the extent permissible at law. It is specifically understood that this will be considered the Buyer’s sole remedy under this clause 10. 6.4. The Buyer expressly agrees that Prop Store shall not be liable in whole or in part, for, and the Buyer shall not be entitled to recover, any special, indirect, incidental or consequential damages including loss of profits or value of investment or opportunity cost. 6.5. Bidders are aware that description revisions may occur on some Lots, and should inquire before the Auction whether any description revisions have occurred on a given Lot and/or examine a lot before bidding on it. Prop Store will make all reasonable efforts to make description revisions readily available during the Auction. 7.1. The copyright in all images, illustrations and written material produced by or for Prop Store relating to this auction, is and shall remain at all times the property of Prop Store. The purchase of these items does not include ownership in or to the trademarks registrations, copyrights and/or any other intangible intellectual properties associated with this item. Therefore purchase of this item does not permit the Buyer to replicate or to exploit this item otherwise. The Buyer agrees to indemnify and hold harmless Prop Store and its directors, employees, affiliates, contractors and agents from any third-party claims, actions, suits, judgments, losses, damages, costs and expenses (including reasonable attorneys’ fees) asserted against or incurred by Prop Store that arise out of or result from any act or omission by the Buyer arising out of or relating to the Buyer’s infringement of any copyrights or trademarks in or to the items or Images. 7.3. In the catalog descriptions, Prop Store takes steps to identify and provide provenance for Lots offered at Auction. In many cases, the Lots offered were used in or in conjunction with motion pictures or other programs and information is furnished in order to fully identify and describe the Lot offered at Auction, including photographs and illustrations. Prop Store in no way claims any connection to or relationship with the producers of the motion picture or other program. In all cases, the use of the titles or other elements of a motion picture or other program is for informational purposes only. 7.5. Bidders are aware that description revisions may occur on some Lots, and should inquire before the Auction whether any description revisions have occurred on a given Lot and/or examine a lot before bidding on it. Prop Store will make all reasonable efforts to make description revisions readily available during the Auction. While Prop Store uses reasonable efforts to include accurate and up to date information in this auction, Prop Store makes no warranties or representations as to its accuracy. Prop Store assumes no liability or responsibility for any errors or omissions in the content of the auction. Any reference images appearing within Prop Store's auction listings are solely for reference purposes and are not intended or deemed to be a representation or warranty of the item depicted within the image. 7.6. All items are sold as collectibles and/or memorabilia for display purposes only, and are not deemed, intended, represented, or implied to be fit for any other purpose. The Buyer assumes all risks of loss and/or injury, including, but not limited to, personal injury or property damage, arising from or related to any other use of the item. The Buyer understands and agrees that Prop Store shall have no liability for any such loss or injury and the Buyer expressly releases Prop Store from any such loss or injury. 7.8. Each Bidder and Buyer expressly agrees that Prop Store shall not be liable in whole or in part, for, and no Bidder or Buyer shall be entitled to recover, any special, indirect, incidental or consequential damages including loss of profits or value of investment or opportunity cost, for any breach of any warranty, representation, or guarantee set forth herein. 8.1. If any part of these Conditions is found by any arbitrator or court of competent jurisdiction to be invalid, illegal or unenforceable, that part shall be discounted and the rest of the Conditions shall continue to be valid to the fullest extent permitted by law. 8.2. The contract is between the Seller, the Buyer and Prop Store and no other person shall have any rights to enforce any of its terms. 8.3. If Prop Store fails to insist on performance of any of a Buyer’s obligations under these Conditions, or if it delays in doing so, that will not mean that Prop Store has waived its rights against the Buyer and does not mean the Buyer no longer has to comply with those obligations. 8.5. Any claim or controversy arising out of or relating to the sale of the item between any Bidder/Buyer and Prop Store shall be submitted to arbitration in Los Angeles County, California before an arbitrator from the Judicial Arbitration and Mediation Services, Inc. (“JAMS”) and conducted under its Comprehensive Arbitration Rules, as the exclusive remedy for such claim or controversy. The parties further agree that the arbitration shall be conducted before a single JAMS arbitrator who is a retired California or federal judge or justice. By agreeing to arbitrate, the parties waive any right they have to a court or jury trial. The decision of the arbitrator shall be final and binding. The parties further agree that, upon application of the prevailing party, any Judge of the Superior Court of the State of California, for the County of Los Angeles, may enter a judgment based on the final arbitration award issued by the JAMS arbitrator, and the parties expressly agree to submit to the jurisdiction of this Court for such a purpose. The prevailing party shall be entitled to recover the party’s attorneys’ fees and costs incurred in connection with the arbitration.